BU Vice-Chancellor’s International Scholarship 2019(बी.यू. कुलपति का अंतर्राष्ट्रीय छात्रवृत्ति) is provided to the students who are planning to pursue full-time Post Graduation Program fro the coming year. The UAL Vice Chancellor Scholarship is paid as a reduction in your tuition fee. Eligible candidates who gets selected for Vice Chancellor International Postgraduate Scholarship 2019 will be provided a reduction of 50% in the first year of the Master’s Program. 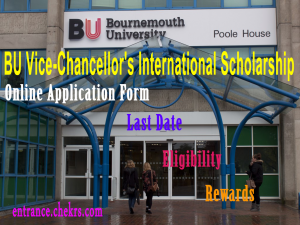 Interested applicants must fill the BU Vice Chancellor’s International Scholarship Application form before the last date 31st May 2019. For more details in terms of eligibility, selection process, rewards etc check go through the article below. The BU Vice-Chancellor’s International Scholarship Programme is applicable for the Mater Degree Programme which is commenced to begin from September 2019. The scholarship is open to the students who have applied for a full-time post graduation course with BU and he/she must hold a good record in their academic study of UG course. In addition to this achievements, candidates must also showcase an outstanding personal profile in the application form. Applicants must be enrolled in a full-time undergraduate course in BU. The scholarship is paid as 50% reduction in tuition fee for all through the duration of the course. Applicants will be notified within one month from the date of closure of application process. Aspirants need to fill UAL Vice Chancellor Scholarship Online Form through its official portal and submit it online before 31st May 2019. Candidates can also mail it to askBUstudents@bournemouth.ac.uk.